It features high sensitivity and information-rich output at 600 MHz proton-NMR frequency, and incorporates advanced hardware, software, automation, spectral libraries and standard operating procedures (SOPs) for high-performance biofluid assay validation and pre-clinical screening. Customer benefits include higher information content and spectral feature differentiation compared to low-field NMR systems, as well as excellent reproducibility, high throughput and potentially dramatically lower cost per sample for better preparation and support of clinical screening and IVD-by-NMR discovery and validation (on RUO level). 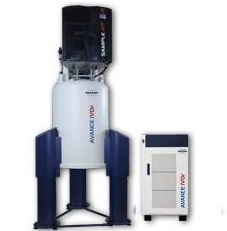 Dedicated to NMR-based pre-clinical in vitro screening and research, the AVANCE IVDr is optimized for ease-of-use and highest data quality, reliability and reproducibility as shown in the figure on the right side. The new standardized platform offers barcode analysis, control by a LIMS system, the high-throughput autosampler SampleJet™, remote access, and automatic analysis and customizable analytical result reporting. Based on Bruker-validated SOPs, the AVANCE IVDr platform enables the development of future potential diagnostic tools for body-fluids that can address a variety of medical questions. The SOPs guarantee the preparation of highly reproducible clinical data, enabling the exchange and validation of novel NMR assays between laboratories on a global basis. In a translational clinical research environment the results produced by these NMR assays can easily be transferred into potential clinical screening and future IVD use. This level of large-scale health-related NMR screening is paving the way for worldwide epidemiological studies as well as for pre-clinical in vitro research. The benefits have been significant: facilitated by the low cost per sample and the even lower cost per parameter as compared to established single parameter screening methods. Novel NMR methods for determining the cause of disease, delivering individualized patient treatment are now enabling many clinical researchers for developing strategies for prevention. Overlay of 6 spectra each prepared and measured independantly on aliquots of a serum sample at Bruker BioSpin Rheinstetten and at Leiden University Medical Center in Holland, showing absolute identity of all spectra. systems. This ensures the B.I.-Methods package is correctly installed and the instrument is properly calibrated and connected to Bruker Data Analysis Server. While the number of Biobanks worldwide is growing rapidly, quality control of the whole process Is a requirement to ensure the value of the biobanks. Standardization is needed to allow researchers to integrate results obtained of specimen tests from 1 or more biobanks. Standardization also includes the QC Process, which needs to cover all aspects of pre-analytics and sample storage. In addi- tion validation of specimen/donor metaparameters is of addi- tional value. NMR is especially suited to perform QC-analysis of liquid biopsies and can deliver a large number of criteria based on one QC measurement per sample. 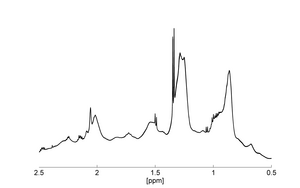 In addition to QC Information NMR can deliver a large number of metabolic information using the same spectra generated during the QC process. 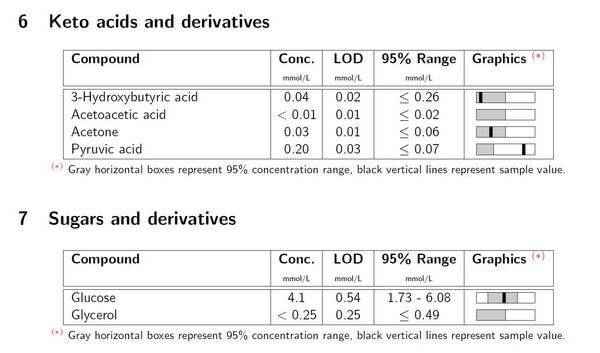 With this information in urine 150 metabolites in 2 age ranges are quantified. In plasma/serum 115 lipoprotein related parameters (including subclasses) and 26 metabolites/parameters are analyzed and quantified, the whole process is under push button automation and can be handled by a trained medical technical assistant. 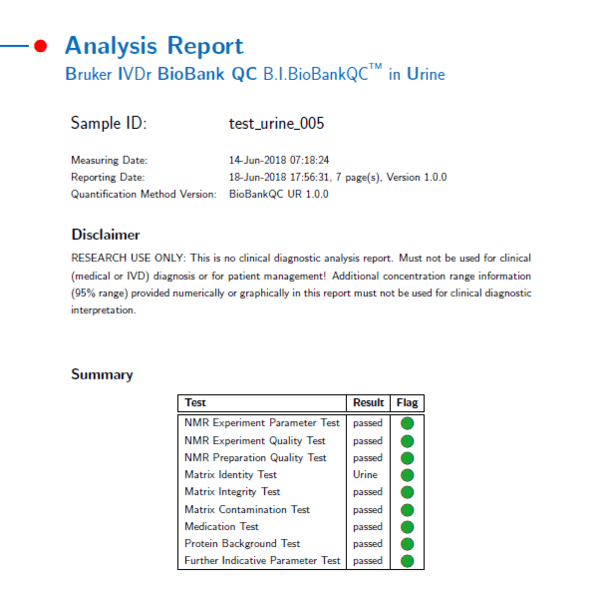 Extract of the summary page of the B.I.BioBankQC-PS and B.I.BioBankQC-UR report. Based on the outstanding performance of NMR in reproducibility and transferability, high quality analysis of data is available to deliver additional information for the biobank specimens. 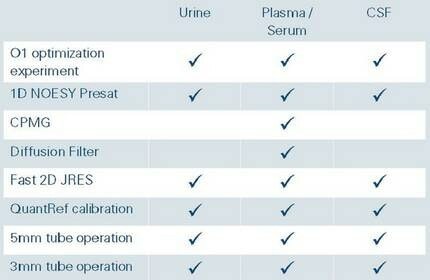 Together with the biobank, tool packages are offered for plasma/serum and urine quantification as outlined before. A multitude of disease relevant as well as endog- enous metabolites and lipoprotein information is delivered extracted from the QC spectra analysis. Based on the IVDr Platform concept and its strict standardiza- tion for NMR data generation, it is possible to select spectra from multiple biobanks for large epidemiological studies on a worldwide basis or to expand the testing range of clinical trials, providing for example spectra from healthy cohorts out of the biobanks Instead of generating always new aliquots. This builds a new value proposition for biobanks, allowing to save cost and contribute to big data in an efficient way. New NMR based diagnostic tests can such be validated on a worldwide basis and multiple phenotypes without exploding the cost of the trial. 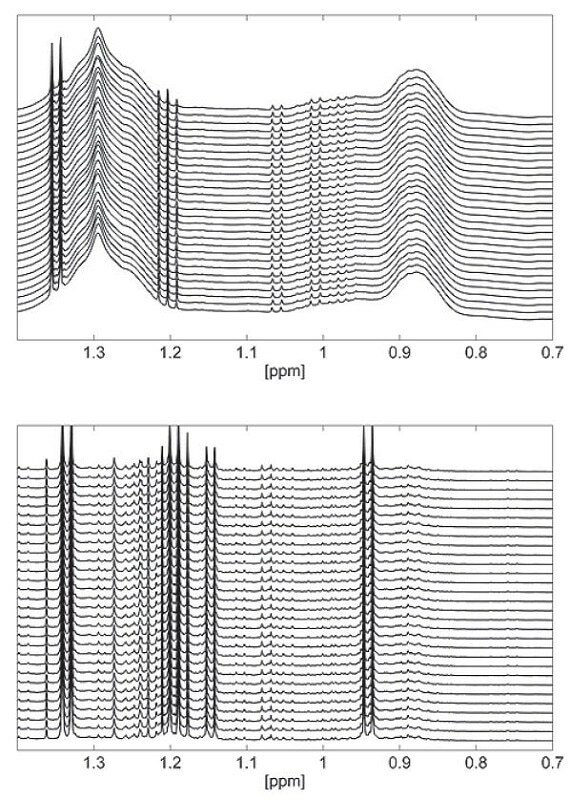 Data generated from a 11 IVDr platform ringtest clearly proof this unique feature of NMR.